Jane Waggoner Deschner’s fascination with early 20th century vernacular portrait and family photography becomes the foundation on which she expresses her own views on life by hand-sewing doodles, images, and quotes onto found images. 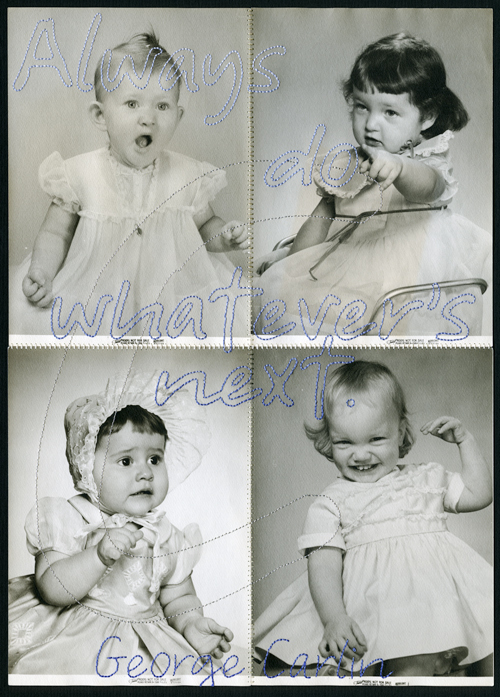 She says, “By asking viewers to look carefully—to read words and/or decipher symbols and signs — I renew and transform their experience of looking at old photographs. By engaging them with other people’s family photos, I alter the way they see their own.” Deschner’s solo exhibition at the UW Art Museum will present selections from several series of her work that will be presented as an ‘installation,’ as you might see a wall of family photos presented in one’s home. Artist Jane Waggoner Deschner discusses her work with found photographs on view at the University of Wyoming Art Museum January 31 - May 16, 2015. 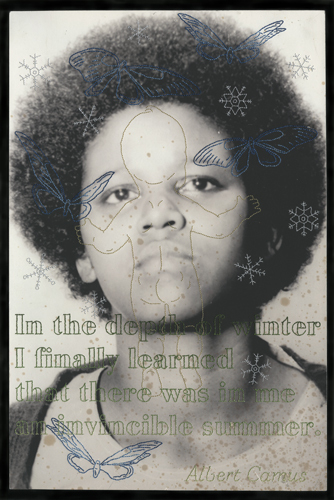 Right: Jane Waggoner Deschner, from the resilience series (Camus, winter, summer), 2013, hand-embroidered found photograph, 17-1/4 x 11-1/2 inches, courtesy of the artist.